Rajendiran M, Dinesh Kumar A, Kanmani Prabhu C, Richard S J and Surendar S. "Experimental Investigation on Light Weight Concrete by Replacement of Coarse Aggregate using Styrofoam with Adding Flyash." International Journal for Scientific Research and Development 7.2 (2019): 36-39. Sahil Santosh Kulkarni, Rushikesh Narendra Gaikwad, Omkar Shrinivas Cheriyal and Vijay Parshuram Chavan. "Information Provider via Biometrics Security." International Journal for Scientific Research and Development 7.2 (2019): 40-43. Rajendra Vaskela and Prof. Pankaj Rathore. "Utilization of Agricultural and Commercial Waste Material in Construction." International Journal for Scientific Research and Development 7.2 (2019): 44-45. Dileepan.N, Rajadurai.B, Ramamoorthi.J, Ravichandran.T and Sakthi.M. "Investigation of Short Hybrid FRC by using Tensile and Wear Test." International Journal for Scientific Research and Development 7.2 (2019): 46-50. Pankaj Kumar, Keshav Kumar Choudhary, Swati Goswami and Reena Jain. "Antibacterial Properties of Grewia Asiatica and Cuscuta Reflexa." International Journal for Scientific Research and Development 7.2 (2019): 51-58. Talib Tariq Wani, Azhar Nasir Wani, Ilawal Zubair Wani and Aatif Iqbal Lone. "Partial Replacement of Fine Aggregates with Waste Glass in Concrete." International Journal for Scientific Research and Development 7.2 (2019): 59-61. Karan Kakashia, Rahul Urkude, Vishal Nagpure, Sayali Perkar and Nikeeta Kale. "Role of Fertilizers in Sustainable Development." International Journal for Scientific Research and Development 7.2 (2019): 62-64. M. Venugopal, Mahamood VP, Muhammed Ali Jalib Davari, Roshith P and Samson Saji. "Design and Fabrication of Aqua Silencer in Four Stroke Petrol Engine with Noise and Vibration Analysis." International Journal for Scientific Research and Development 7.2 (2019): 65-66. Sivakumar.N, Shahwaz Alam, Vishnu P. Nair, S Chellapandi and Mohammed Afnas V . "Performance Analysis of Composite Materials by Hydrostatic Pressure Vessel." International Journal for Scientific Research and Development 7.2 (2019): 67-70. Akash Vilas Lad, Akash Lad, Priyal Vadgama, Stimit Sonawane and Aniruddha Wadekar. "Calculating Equation using Object Character Recognition." 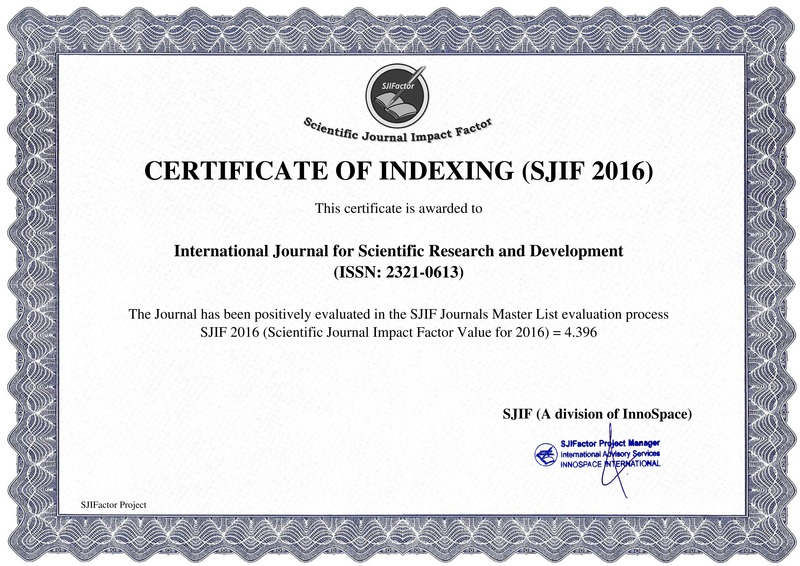 International Journal for Scientific Research and Development 7.2 (2019): 71-72.